Innovation prize goes to Austin resident Brandon Ward. The first-ever [Re]Verse Pitch Competition awarded a $10,000 innovation prize to Austin resident Brandon Ward for his idea of turning spent grain, a byproduct from the brewing process, into “Brewnola” granola bars. Ward is one of eight finalists who presented ideas on how to repurpose byproducts at the final competition Dec. 9 at the LBJ School of Public Affairs. He presented alongside two team members, Matt Miller and Ceschino Brooks de Vita, who are his classmates at the UT McCombs School of Business. The winning pitch proposes to create a company that would pay employees $24 per hour, locally source ingredients for the granola bars, use compostable packaging, and donate a portion of proceeds to Austin-area homeless shelters. Ward plans to use the prize funds to prototype the product and conduct market research before launching larger scale production and distribution. 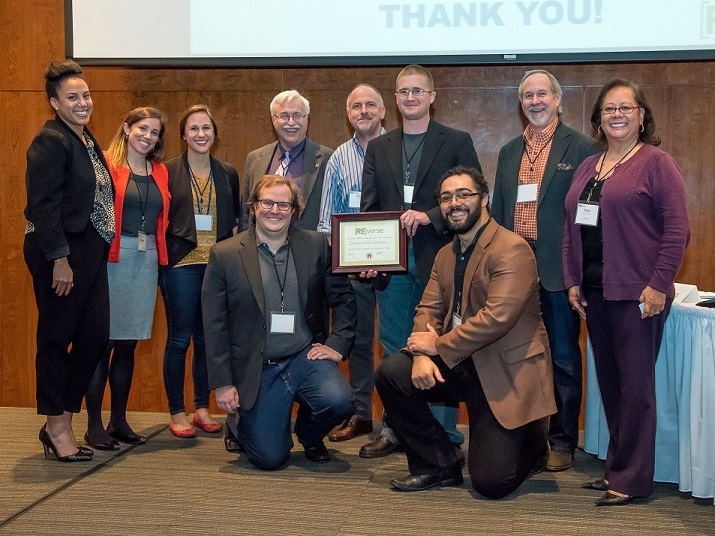 In addition to inspiring entrepreneurs to look at waste as a profitable venture, this competition also served as a prototype for challenge prizes at the City of Austin. The City’s Office of Innovation is exploring how challenge prizes might be utilized as a tool for other public challenges in the future. The [Re]Verse Pitch Competition is a one-of-a-kind social innovation program to turn valuable raw materials that are currently leaving local businesses, nonprofits and institutions as waste into the foundation of new social enterprises. The competition started in November when five local companies and institutions pitched byproduct materials to social entrepreneurs. These entrepreneurs created business ideas using these byproducts. The judging panel included Ray Brimble of Lynxs Group, Scott Collier of Pasadera Capital, Bob Gedert of Austin Resource Recovery, Zoe Schlag of Unltd USA, and Rosa Rios Valdez of Business and Community Lenders of Texas. In addition to points from public voting, judging was based on business viability, sustainability impact, economic impact and social impact, along with effectiveness of pitch delivery.